After a 9 month search for the perfect space, owners, Al and Jen Lettera and Matt and Laura Cox, decided on Boynton Beach for the brewery when they found a great building that was perfect for their operation. The bonus was that the building owner was happy to work with them. 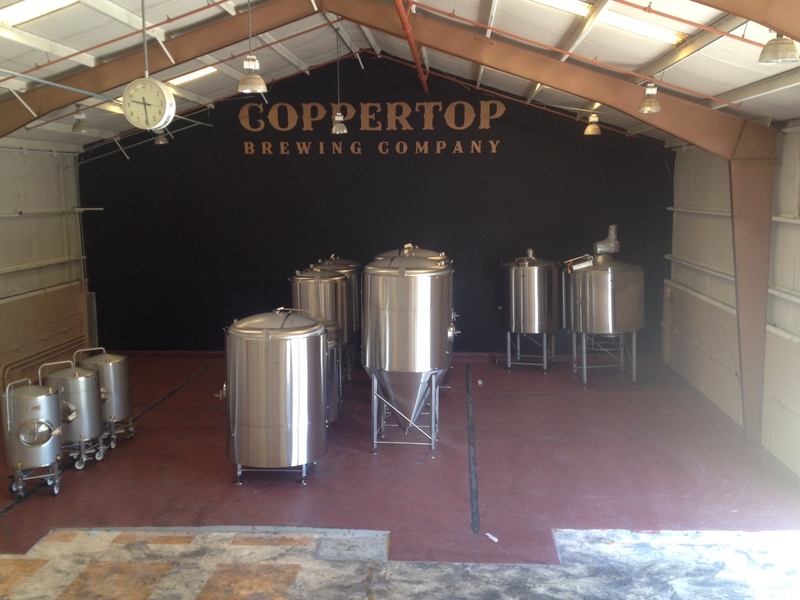 They also found Boynton to be the most friendly to new breweries coming into the city (the city of Boynton actively recruited Coppertop), where other cities were resistant when it came to zoning and codes. The brewery space is large enough to accommodate a 10,000 barrel annual capacity (which is a goal for Coppertop growth) and will start with a capacity at 2,800 barrels per year. Brewmaster, Matt Cox, will be brewing his “traditional beer styles with bold, intense flavors” and several seasonal beers that will range from 5%-12% alcohol on a 20 bbl, DME brewing system, built in Prince Edward Island. Initially utilizing 5 fermenters, (3 – 20bbl and 2 – 40bbls). Patrons can enjoy what Matt describes as “diverse beers and some experimental, out of the box styles” in a spacious, and nicely built out, air conditioned, tasting room. The tasting room will have a warm, industrial feel with a glass window looking into the brewery. The full time tasting room is open to the public who can come for a pint, growler fills, tours, and catch some games on TV. Food will be made available by delivery; food trucks or catering. Cox, started brewing in 1999 and took over brewing operations at Big Bear Brewing Company in 2001. He has won 50+ awards, including the prestigious Gold Medal at the Great American Beer Festival (GABF) for his Belgian Dubbel. He has also taken Gold medals at the North American Brewers Assoc., multiple medals at the US Open Beer Championships, and multiple Grand National Champion Awards at the United States Beer Tasting Championships. Where Matt is in charge of brewing operations, his partner, Al Lettera’s role with Coppertop is in business operations. Al brings his own experience in the brewing industry as one of the initial investors in SweetWater Brewing in Atlanta and still holds shares to date. Al’s background is in technology/e-commerce. Al and Matt met through a mutual friend 4 years ago. The name Coppertop is an homage to Matt’s wife’s signature, vibrant red hair. According to Matt, Laura has been extremely supportive of his career, and as a big fan of the products; he reports that she helps with tasting and dialing in the recipes. As for their vision for the company, they report, “our goal is to keep it owned by Matt and Al”. “We plan to start in Boynton as our home base and blanket the area through slow, organic growth through the tri-county area, and eventually the state. The timeline for opening includes having the brewing system in place by the end of October and be fully operational by mid-November. The goal is to open the tasting room and putting beer out into the market before the end of the year. Coppertop will start initially with draft selections and shortly after offer small packaging runs of bottled products. The lineup will include, amongst others; Coppertop Lager (a Vienna Lager that is very malt forward with big bold flavors), Tomahawk IPA (an IPA with intense but balanced hop flavor using lots of whole leaf and signature Tomahawk hops) and a Belgian Wit (a classically brewed Wit with wheat, barley and oats and spiced with coriander and local Florida orange peels).